Directions once on Southern Cross Drive?. 6.To enter, press 3118 (provided on booking confirmation) on the touchpad then CH1. The gate will open and close automatically ? you will need to use this pin again on your final departure. 8.Proceed to reception through the front door of the Homestead. Pets allowed in Cottage only - no extra charge **Two night minimum for all bookings** **Ginninderry is an adult retreat and not suitable for infants or children under 16 years** Idyllic homestead located on 70 acres of working farm. Paci Day Spa located on property as well as our function centre catering for weddings, conferences etc. Beautiful gardens with meandering creek wrapped around the homestead and cottage. The cottage is located in the gardens and is very private. Contains 1 Want to escape to the countryside? You can't go past the comfort and charm of Ginninderry Homestead (just 15-20 minutes from the heart of Canberra); perfect for couples, a corporate alternative, or group get-together. This exclusive retreat possesses beautifully manicured gardens and unique 4.5 star accommodation (AAA Green Star approved ? the regions first!) which evoke another world.. This luxurious homestead, situated on a 70 acre estate, comprises four queen ensuite rooms (Deluxe or Superior) all tastefully decorated with antiques and sumptuous soft furnishings. The self contained cottage is located in the midst of the pretty gardens, has 1 bedroom, lounge dining area, bathroom, laundry and a secure courtyard which is ideal for petc. Ginninderry offers understated elegance and charm, while providing modern comforts. Chat or doze away in a comfortable chair on the verandah, stroll through the gracious gardens, or relax beside the trickling creek. Enjoy the calm ? simply magical? We have a passion for our oasis and would love to share it with you. Extracts from the Sydney Morning Herald: This is surely one of the best places to say in - or just outside - Canberra. The homestead consists of four cosy queen-sized rooms filled with antiques, and the place is run with the efficiency and attention to detail you?d expect of a modest boutique hotel, with facilities to match. Cosy and comfortable yet spacious, our deluxe queen ensuite rooms offer a small lounge area, antiques, sumptuous soft furnishings and beautiful views of the manicured gardens. Tariff also includes use of the communal formal lounge room, upstairs sitting area with tea/coffee making facilities and kitchenette facilities with fridge and microwave), verandah and surrounding gardens. Free buffet continental breakfast included in tariff. Our guests just love these large queen ensuite rooms; their French doors offer wonderful views of the meandering creek and hills where the kangaroos reside. Fine furnishings including a small dining table, lounge and other antiques make for a worldly feel. Also offering beautiful linen, evaporative cooling and DVD player. Tariff also includes use of the communal formal lounge room, upstairs sitting area (with kitchenette facilities, fridge and microwave, coffee machine. A buffet continental breakfast is served in formal dining room. Bed and Breakfast: No Cancellations. No Changes. 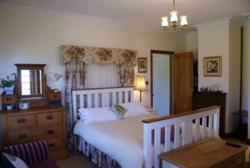 All tariffs are for two adults sharing a queen room/bed. . Self Contained Cottage: No cancellations. 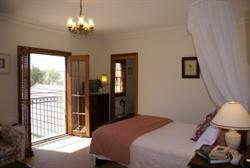 No changes Cottage sleeps 2 - tariff $230 all inclusive Group packages available on request. Check-in is after 2.00 pm and check-out is before 10.00 am. Early check-ins and late check-outs are available at $20.00/room/hour (with prior arrangement). This includes access to the property and surrounds.